If the one thing that's stopped you from having a fear of insects is the certainty that they're not smart enough to plan your demise, it may be a good idea to stop reading. 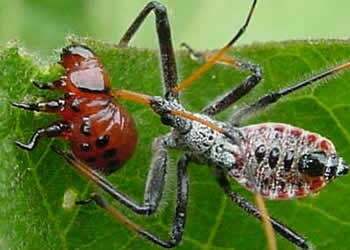 Everyone else, meet the Assassin Bug. The spider thinks it's getting a meal, but instead gets eaten itself. The one thing we have over this bug is size. Pray that it doesn't work out a way to get significantly bigger quickly.